It was late 2011 when a new client sat in our conference room and told us about a nugget of an idea: to build a company that would allow people to eliminate the dreaded process of buying a car at a dealership. The concept was simple – 100% online shopping, buying and financing. There were no secrets and all of the necessary information was out in the open. “What do you think,” asked Ernie Garcia, Jr.? 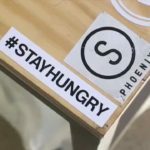 “Let’s do it,” said the team at Blind Society, a branding and creative agency in Scottsdale. So for the next five months, we served as strategic and creative partners and helped define the vision. Using Blind Society’s Brand Discovery, Brand Identity and Brand Visualization process, we collaborated to bring the Carvana brand to life. It all started with research. A lot of research. From competitors to personas (consumers), our strategy team dug in to uncover the insights that would ultimately lead us to positioning Carvana for success. A dive deep into how people searched for cars online and determining if they would ever make such a huge purchase without ever seeing the car. The answer, yes they would. 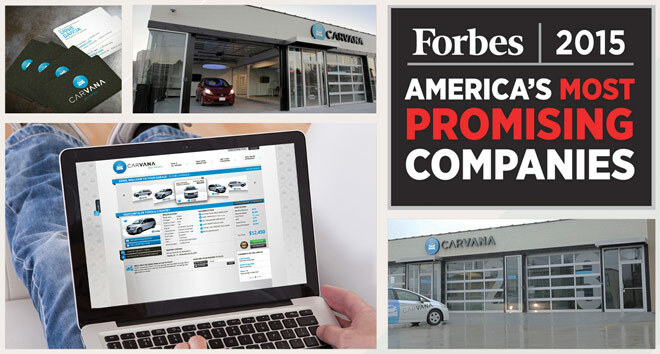 This month, Forbes released its 2015 list of “America’s 20 Most Promising Companies,” and we’re thrilled to see Carvana on the Top 5! Read more here. Using Blind Society’s Brand Discovery as the blueprint, our agency’s creative team went into naming and logo design. That’s when Carvana was born. A blend of Car+Nirvana, the feeling we knew consumers would experience with this magical no-fuss car buying brand. From there, we went straight into the Brand Visualization: identity system, digital strategy, website and mobile design. 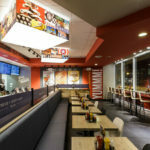 View the project case study. It’s a branding success story because from the start, the founders of Carvana understood the importance of investing in their biggest asset: their brand. The founders knew that the right brand was essential to building trust with a skeptical audience. So it was about spending the time to understand why the world needed their company and positioning it to be catapult into success by its best customer. Carvana officially launched in 2012, pulled in about $5 million in 2013, and last year the company generated $45 million. There’s no doubt that Carvana is well on its way to becoming a household name. Speaking of that, check out their commercial that ran in American households during Super Bowl 49! Well done, Carvana! We’re thrilled for you guys and so grateful to have been there from the beginning.